The country’s biggest bank by assets, BDO Unibank, is rolling out an Easy Investment Plan to encourage depositors to set aside money every month from their savings accounts for eventual placement in higher-yielding investment funds. 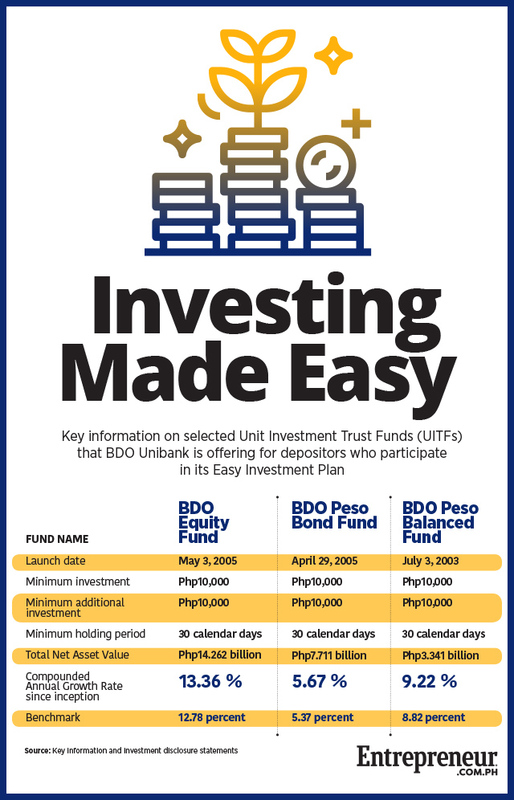 Under the plan, BDO will automatically move least Php1,000 from participating depositors’ savings or checking accounts until enough money is accumulated for investment in any of three BDO Unit Investment Trust Funds (UITFs). These are BDO Peso Bond Fund, BDO Peso Balanced Fund and BDO Equity Fund. The minimum investment requirement for any of the funds is Php10,000. The three BDO investment funds have recorded compounded average growth rates of 5.7 percent to 13.3 percent each year as of December 2017 since inception, according to the funds’ key information sheet and investment disclosure statements (see infographic). Those annual returns are much higher compared to the annual interest rate of 0.25 percent earned by a BDO Savings account and 0.50 percent earned by a BDO Peso Time Deposit account of up to Php10,000. BDO will automatically deduct the amount specified by the savings account holder on a monthly basis based on the frequency and schedule he or she requested. EIP holders may also withdraw their contributions anytime without penalty 30 days after it has reached the regular minimum investment amount of a particular fund. Account holders will only be able to invest in UITFs by the time they have allotted at least Php10,000 to the program. “Smart investing creates bigger wealth over longer periods of time. The key is finding the right investment that you are comfortable with and equally important is to find the right partner who can guide you in making the right decisions,” BDO Executive Vice President and Head of Trust and Investments Group Ador A. Abrogena said in a press release. UITFs are open-ended pooled funds managed by professional entities such as banks. The funds are in turn invested in different securities and investment products like bonds and equities. They are often considered as medium and long-term investments and come in several forms. According to UITF.com.ph, bond funds are invested in higher yielding bonds and are suitable for risk-tolerant investors. Equity funds are invested in equities or stock investments, aiming for capital gains but have higher potential for losses. Meanwhile, balanced funds are for those who want to invest in the medium term with a portfolio mix of equities and fixed-income securities. As of December 2017, total assets of the three funds stood at Php25.9 billion.